Pokémon Go is an augmented reality game which mixes real-world elements into game. 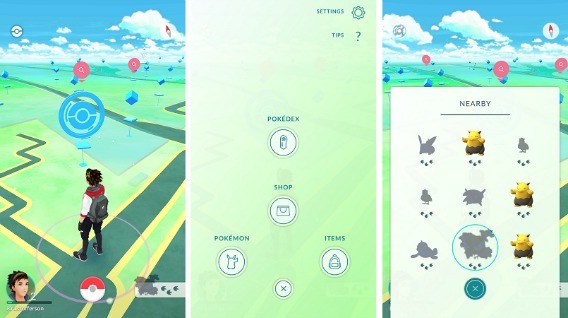 The game request gamer use their device GPS function and clock to decide which Pokémon appear in the game. Gamer explore surroundings cities and towns to search, locate, catch, battle and trade Pokémon. As gamer move around, their smartphone will vibrate to let them know if near with Pokémon. Once encountered Pokémon, take aim on smartphone touch screen and throw a Poké Ball to catch Pokémon and add to collection. In addition, gamer also encouraged to connect with other nearby Pokémon GO gamers and check PokéStops locations such as public art installations, historical markers, and monuments where can buy or collect Poké Balls and other items. Pokémon Go also has gyms where every gamers can fight to become gym leaders. Pokémon GO is available as free download to play, however gamer need to buy PokéCoins (in-game currency) via in-app purchases if want to unlock special items within the game. In addition, Nintendo has also announced available to pre-order for Pokémon GO Plus which costs $34.99. Pokémon GO Plus is another device developed and manufactured by Nintendo. Pokémon GO Plus is designed for Pokémon GO fan to enhance enjoyment of the augmented reality game. With Pokémon GO Plus, games can access and play Pokémon GO without looking at their smartphone. The device will connects with smartphone over Bluetooth to delivering haptic feedback with flashing LEDs to notifies gamer about events within the game, such as Pokémon nearby ready to catch or item to collect. Besides that, there is also a button on the front of the Pokémon GO Plus device that lets gamer act like “trainer” perform actions such as throwing Poké Ball to catch Pokémon. Updated: Pokémon GO has announced added 26 new countries across Europe such as Austria, Belgium, Bulgaria, Croatia, Cyprus, Czech Republic, Denmark, Estonia, Finland, Greece, Greenland, Hungary, Iceland, Ireland, Latvia, Lithuania, Luxembourg, Malta, Netherlands, Norway, Poland, Romania, Slovakia, Slovenia, Sweden, and Switzerland. Pokémon GO fan can download from the Google Play Store or iTunes App Store by today.